I am so thankful for this past week. I have gotten some much needed rest. And with that rest, God has done a few wonderful things in my mind and heart. Being a teacher in the past, an analogy comes to mind. A teacher has a challenge before them each unit of study: by some form and fashion, each unit holds with itself goals of learning, milestones that measure the learning of that particular section. You can not move forward until those are completed. As some of you know - especially homeschool mom's, sometimes those milestones fall together very haphazardly - children learn in different ways. If a child is not ready to grasp something today... after some time, growth, and patience, in their own unique way, that milestone is grasped. We can't really decide the order and time it happens, but it does happen. I don't know about you but over the last year I have been giving myself a lot of liberties in the sweets area. Somehow a sneaky philosophy came over me - "I worked out this morning, so i can eat dessert every meal AND three oreo's with a small glass of milk today..." or "I will workout in the morning so I can have my favorite brownie cup with ice cream dessert creation... again, tonight..."
I was in denial. I have come to realize I need HELP! I must stop. Now, no like a few months ago. I confess... i have fallen... yes, pride comes before a fall... me, Miss Health Nut. So... a few weeks ago (actually it was Christmas WEEK of all weeks) I had had enough of myself: there were things pushing out where I have never had problems before... good grief. An idea has been flapping around in my head... over giving. I can't exactly do a "comment on my blog and in two days you may win this magnificent prize" - kind of contest or drawing, though I don't think it would be too hard for the five of you who read; you should get a prize just for visiting, as it means a LOT to me. BUT, I wanted to give something via my blog. 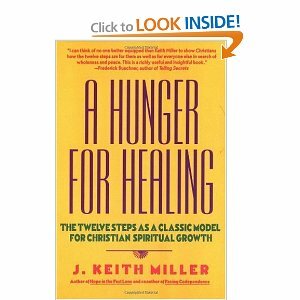 Hunger For Healing by J. Keith Miller. I love how God is with us. He is so tender, so gentle, so patient... so good. 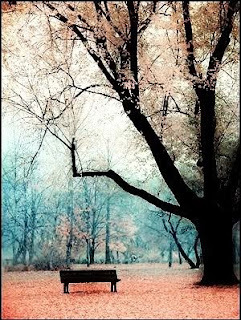 There are many things in my heart and mind and life that tempt me to get all wound up, worried, anxious, perplexed. I usually have a hard time leaving something alone too. I pick at it over and over and over... like a child who just can not leave well enough alone and spoils the surprise with immature impatience, a lack of trust. I am officially looking for a full time job. My current job has exhausted itself; my program is coming to a halt with only my internship to complete. Finishing my internship will take a while I am guessing and right now it looks like a very haphazard thing; a little here, a little there... So, I must look for fulltime employment. Hunting for a fun job, in this time and place, and always with me being the hunter, is a challenge! I have a few things on my resume that look good and are very helpful, but I admit i feel very intimidated, scared, weak, and unacceptable. Talk about vulnerability. I hate hate "selling" myself. hate. it. Being Chosen is my favorite. It's everyone's favorite! When I look back over my career path, 9 out of ten of those were handed to me. Seriously, once i simply walked on the premises and a lady met me on the sidewalk in front of the main office and offered me the job! Okay, this is South Carolina. I know I mentioned a few months back the joys of each season lasting 3 months, give or take a few weeks; offering a good heaping, helping of that particular season weather. I am trying to remind myself of these perks when I am too cold to even take my poor puppy for a walk. 1. Kitty is much more affectionate; even now she laying over my arm as a type. She is a great little heater. 4. A cozy house: there a so many homeless here in Columbia, I can't even imagine what it would be like to roam the streets in tattered clothes, especially in this weather. "Tis the Season to be Jolly...."
I have rolled into this season with mixed emotions. I am facing saying "goodbye" to my brother and his family in a few days.... the semester is closing fast and i am not sure what is happening next. It is haunting me like an invisible ghost - something is there i just don't know what. These unknowns, and closings and changes... ugh, i can't really say i am all that jolly. YET, in the last few months I have sensed in my being a gentle settling... i love my new church, i love the potential ministry opportunities... I am hopeful for what is ahead and God keeps reminding me His heart is worth Trusting even when I can't see: He fills me with inexpressible joy and peace. I am a little tired today. It can all be blamed on this varmint. Last night my folks came to town bringing sweet Sasha home! She seemed happy to be home and we all loved on her a lot - she really liked that! I came home from school to find a wonderful dinner of grilled hamburger and mac'n cheese! Toys were typically haphazardly ornamenting the living room floor - evidence of my brother and nieces being present for a mini-family reunion. It is nice to come home to a full house - yet my house screams "little house" when they all descend. I have loved this song for a long time ago - I first heard it while working at Brother John's in Toccoa, GA; it would play on the radio and it just made me smile every time I heard it!!! Now... what's one of your favorite Christmas songs?? I dedicate this post to all my nieces and nephews... love you all!! My goodness!! I can not even put into words how happy I am that I am able to be back into my blog!! I have been locked out for almost a week; and i was seriously feeling some grief over losing my blog here. I could hardly believe the loss i felt! This little blog has become like a first born to me... my creative outlet, my baby.... and I thought i had lost it forever!! !